I'm sorry to do this to you guys halfway through Rock of Love, but I've just got to take a break. I'll be taking the next month or so off to try to get my juju back. I've been blogging for a little over a year, and it's starting to feel like a second job, with all the fun and delight implied by that phrase. I worry that it's started to show in my writing, and as readers, you deserve better than that. I'm not sure what I'll do after the break; I might jump back into this blog with renewed vigor. I might change the format or cut back on my posting frequency. I might see if I can join another site so I won't be the only party responsible for content. I really can't say right now, but as soon as I figure it out, I'll let you know. Feel free to poke around in the archives or visit the awesome sites on the right-hand bar there. I hope all 12 of you are doing well and I look forward to writing for you again... when I can look forward to writing. If that makes sense. Thanks for your patronage and patience. As with the Flavor of Love franchise, the nominal "prize" of a VH1 dating show may think he's the star, but he is soon eclipsed by the women vying for him. (Only New York was able to keep the focus on her during I Love New York, and I kind of have to respect her for that, a little, tiny, begrudging bit.) This week, a couple of contestants stood out, for rather different reasons. One for her inexplicable belief in the possibility of finding love with a middle-aged dude in eyeliner and extensions, the other for her continued commitment to weirdness (tm Rich). Like you didn't know who I was talking about. I've heard something recently that bummed me out to a surprising degree. An online buddy of mine tells me that the winner of Rock of Love was told by the producers in the first few days of filming that she was going to win, and advised to act nice so viewers would like her. Reading that made me feel like an all-day sucker, 'cause I'd already fallen for it. 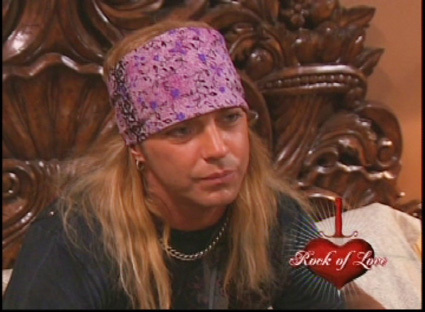 I mean, come on, even Bret Michaels isn't allowed to pick his next three-week relationship?! 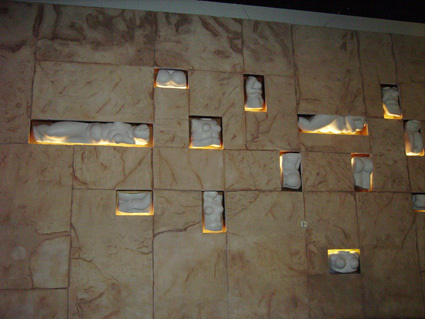 This is the wall outside the top-flight restaurants at Mandalay Bay Resort in Las Vegas. Yes, those are disembodied breasts, butts and torsos. (And, I just now realized, all the breasts look like implants rather than organic hooters.) I can think of no better representation of Las Vegas. Well, you see what I'm getting at: a side that ain't too pretty.